Frank Verrilli is a high end artist-- painter & sculptor, with a variety of works exhibited around the world (ck out the links below). He just happens to also dig guitars, especially Strat & Tele type platforms. 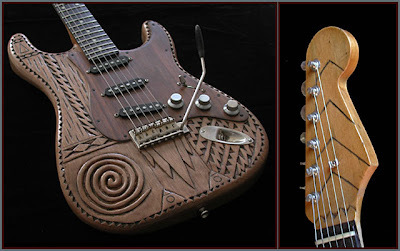 The "Spiral Guitar" above is just one example of several builds currently featured & listed at the premier art guitar & boutique builder site Destroy All Guitars. What really amazes me is that considering Verrilli's other work and resume' can create other perspectives about these guitars we play and blog about. I mean, we guitar players love guitars and agree that they're beautiful, but it's a high kind of compliment to guitar when a fine artist in other mediums embraces the guitar in unique ways. You really must look at Frank Verrilli's sculpture work to get where I'm coming from here.